Fiber Flux: How I Knit and Crochet On The Go...New video! How I Knit and Crochet On The Go...New video! With summer on its way, tis the season for road trips and day trips! As a mom, I am constantly running errands and shuffling kids around too. I make sure I always have my trusty project bag wherever I go. In fact, most of my crochet and knitting time is here and there throughout the day in between everything else going on! A YouTube viewer asked me the other day what I use when I'm on the go with my projects...check out the video below where I take my tote bag apart and reveal the contents! Click below to see how I travel, road trip, and run errands with my crochet and knitting! 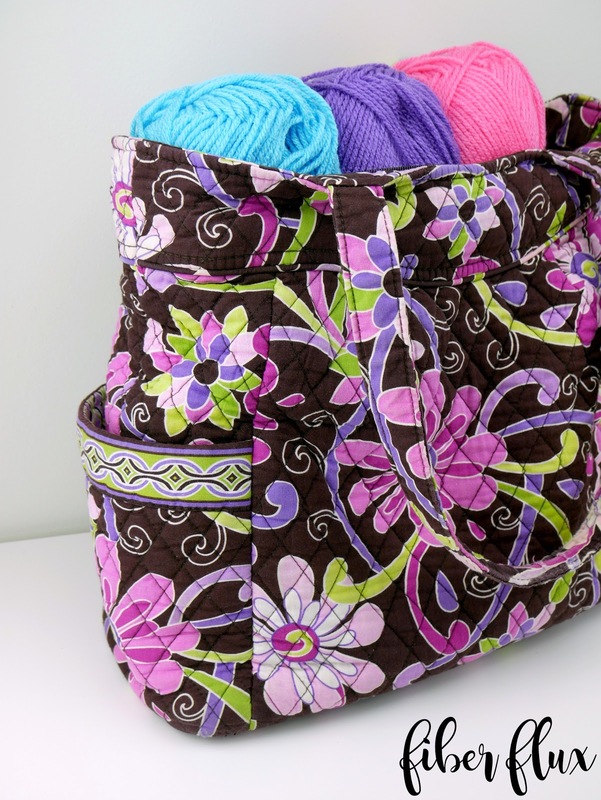 I have a huge collection of Vera Bradley tote bags, most with the open toggle closing - so I decided to use (at least half a dozen of) them to store current projects in my at-home stash. I have enough of the VB bags that I can even "color cue" a VB bag to the predominant colors of the project. ;-D I don't travel with these bags; I have a couple of zipper-top bags I use for travel. I also use the large organza bags that one online yarn source sends their product in, as an interior bag alternative to your freezer-bag idea.